In case you are wondering what to serve for a late lunch on a November weekend, this is it. You may be thinking that it is only Wednesday, but if you are like me it is the thought of the weekend that keeps my blood thumping through the week. I have a special reason to look forward to the weekend;this Friday night, The Quiet Man and I have tickets to the Five Browns in concert. Have you heard of them? 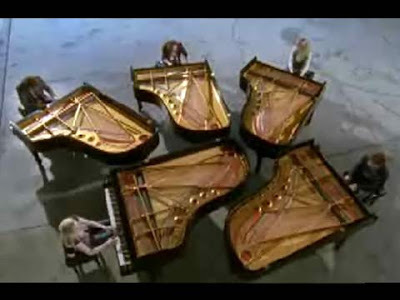 Five Julliard trained siblings pound out piano pieces together. I've been following their story in print for the last couple of years, so I was delighted to find that they'd be coming to this gorgeous outdoor theatre. Practically in my own backyard! But I must confess that I wish the charges were coming too. What could be more inspiring for their own piano practice? If only see where all those tedious scales could be leading to. Fame! Fortune! Sibling Unity! (I'd take two out of three. Or even one. Or one half. ) I may just bite the bullet and buy two extra tickets, in the name of educational aspirations. But I'm here to tell you about macaroni and cheese, not macaroni and music. I love this version, adapted from Joy of Cooking. As far as mac and cheese goes, it's a medium in terms of decadence. It's no saint, with it's butter and cheddar cheese, but I've seen far more evil versions. (I saw one version that called for 6 tablespoons of butter per serving-criminy!) And besides, I was going to recommend that you serve it with that healthful apple salad that I posted yesterday. Just leave the cheddar off the salad, so it doesn't steal the cheesy spotlight. Have a Yankee Doodle Dandy of a week, and call it macaroni for the weeekend. Money Saving Tips: This one's good and cheap, so make it when you find a good deal on good quality cheddar. My very favorite is Tillamook. The next time you cook pasta, don't throw out the water. Cook up an extra 1/2 lb. of elbow macaroni and make mac and cheese a couple of days later. Preheat oven to 425 degrees. Melt butter in a large saucepan over medium heat. (Use a large saucepan so that you have room to add the pasta in later.) Add onions and saute for 5 minutes, or until softened. Stir in flour and whisk until blended and smooth. Off the heat, slowly whisk in milk. Return to heat and bring to a simmer, whisking constantly. Simmer for 1 minute, or until sauce is thickened. Off the heat, stir in cayenne, mustard and 2 cups cheese. Stir in pasta and mix until well coated. Season to taste with salt and pepper. Butter a 2 quart casserole dish. Put half of the pasta in the dish. Sprinkle with 1/4 cup cheese. Add remaining pasta and sprinkle with remaining 1/4 cup cheese. In a small bowl, combine crumbs and butter. Sprinkle over the top of the pasta. Bake for 10-15 minutes, or just until the crumbs are browned and the dish is bubbly. This is great! I've been looking for a mid-evil macaroni recipe. Thank you so much. I was craving Mac & Cheese this weekend. Flipped thru a bunch of recipe books and didn't find one that stood out. Your's look's like it will fit the ticket. The 5 browns are a talented family. Hope it inspires your young ones. And yeah, about those Browns. They are awesome. We grew up going to the same music competitions. I hated them for a while, now I just sit back and admire. What an amazing family. looks delicious!! Have fun at the concert, it sounds like it will be wonderful! I haven't heard of the Brown's hope you and your charges have a wonderful time at the concert! The mac and cheese looks scrumptious. Quickly changed dinner plans! This looked delicious and I'm always trying to convince spouse that the box stuff is absolutely disgusting. Sorry to hurt your feelings Kraft. This looks so yummy. I hate boxed mac and cheese. My kids love it but I am trying very hard to convert them to the real stuff. But...the real reason I am here today is to tell you that we had your pulled pork with cole slaw on homemade wheat buns and I was in love with it. I doubled the recipe and froze half for another day but now I wish I'd just left it in the fridge so that I could have a repeat today. Yum! Thanks! Yummy. I love homemade mac-n-cheese so much. Just waht I need now! A big bowl of mac and cheese before heading to the gym! Lovely crust you have there! This is pretty much how I make my mac and cheese too. So creamy good and homey. This is seriously making my mouth water!!! We're doing this for dinner tonight, for sure. I was just at that outdoor theater to see ODT's "Thriller" - it is so awesome down there!